Australia Day Melbourne provokes images of awesome times around the grassed areas of the Yarra River or at great Melbourne restaurants and venues enjoying an Australia Day lunch (it might even be a BBQ lunch) and refreshing summer drink. It also provokes ideas of getting out in the Yarra Ranges, down the Mornington Peninsula or to the St Kilda Beach with friends. Some people like to stay at home around the house and invite friends around and watch the Aussie sports like cricket and tennis being played on TV. Others in Melbourne get along to the Australian Open tennis carnival held in that time. For the most part a lot of people will have BBQ's going in Melbourne on Australia Day. 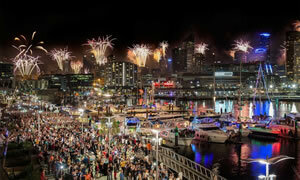 If you need some great celebration ideas in Melbourne this Australia Day holiday then we have some ideas just for you. But HURRY as these won't last. Melbourne for Australia Day is a wonderful city to celebrate everything Australian. Either down by the Yarra River or near Port Phillip Bay or in the nearby suburbs or countryside. 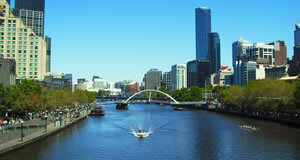 Find somewhere nice to break bread and enjoy your Australia Day Melbourne style! We hope you like these ideas of what's on are helpful. 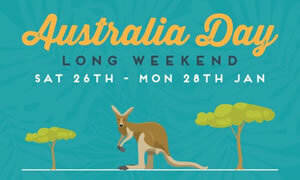 Party down this Australia day in Melbourne with some refreshing summer drinks and lunch specials. Plus on the Sunday the hottest 100 music, sounds awesome. And that is exactly what The Wharf Hotel are doing along the Yarra River opposite Jeff's Shed. Party on Australia Day with a weekend of DJs and LIVE music. On Sunday it's Aussie, Aussie, Aussie, as the Hottest 100 countdown heats up LIVE & LOUD at Hopscotch. Wind down on Monday more LIVE music from 1pm. An icon in Melbourne for Australia Day is the Young and Jackson Hotel near Flinders Street Railway Station. And this hotel has some awesome Aussie LIVE music lined up and a fab Aussie menu! Oi! Oi! Oi!. Make sure you checkout the rooftop and don't forget to drop in and say "Hi" to Chloe! Celebrate the Australia Day Weekend by the Riverfront at the Boatbuilders Yard. Be entertained by music from DJs and the Triple J Hottest 100. Dine from Boaties Breakfast, Lunch and Dinner menus right on the Yarra River. This Australia day holiday even why not stay overnight at the Amora Riverwalk right on the Yarra River and only a short tram ride into the city along Bridge Rd. Great food and service for families as well. Have a stress free Australia Day and spoil your self. Recover from Australia Day by keeping the party going at Campari House. The Day After Australia Day head up to Campari's Rooftop for the Triple J Hottest 100 plus fantastic food and drinks specials including a burger and schooner of Furphy for $20. Mmmm, sounds delish. Australia Day Weekend: Game. Set. Match. 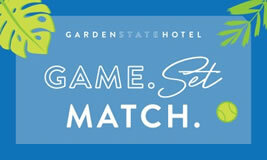 Don't miss a minute of the Australian Open Tennis action this Australia Day Long Weekend at the Garden State Hotel. Grab a table in the Beer Garden or Public Bar and watch the tennis LIVE on the screen. Plus cool down by treating yourself to some homemade soft serve ice cream. 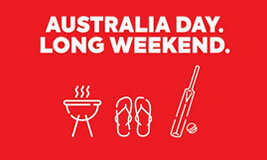 Temperance have another huge Australia Day Long Weekend planned. Kick it off on Australia Day Eve with some of Melbourne's best DJs till late. 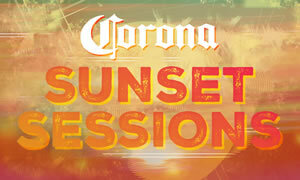 Enjoy Corona buckets and drinks specials Australia Day with DJ beats till late. Plus Triple J Hottest 100 and LIVE DJs on Sunday. No Cover Charge – Open Late. Getting out of the house on Australia Day? Like LIVE sport and love to party? Then head on into Turf and catch all the action on the screens whilst enjoying some great pub grub, and cool drinks. 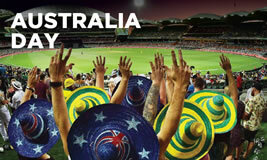 What better way to celebrate Australia Day than with a nice big dose of Sport! 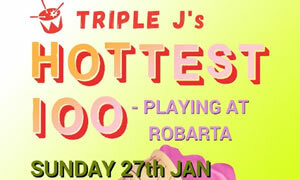 This Australia Day Weekend Robarta are pumping out the Triple J Hottest 100. Enjoy the best music whilst you chow down on some FREE BBQ eats. The party will then continue into the night with DJs on the Decks from 10pm. Enjoy the long weekend and party all Sunday at the Albion. A massive double Sunday Session awaits with 12 hours of entertainment over 2 levels. With the Monday off you can safely party into the night to the massive line up of acts. Dine in for Lunch or Dinner this Australia Day and experience the Great Australia Bite a mouth watering Lamb Rack paired with an exquisite Australian Wine. Down in the waterside bar you be treated to an Aussie BBQ with matching buckets of Beer. To top it all off amazing views of the Fireworks. This Australia Day it's laneway DJs and Expresso Martinis at the Bridge. But that's not all for the long weekend. On Australia Day Eve be treated to entertainment all night and on Saturday and Sunday it's the Hottest 100 and 200 countdowns from Triple J. Looking to party this Australia Day? 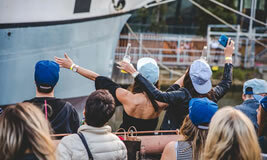 Check out our quick guide for some of the best parties, BBQs and happenings in Melbourne over the Australia Day Holiday. 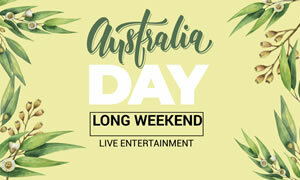 Australia Day Long Weekend With refreshing summer drinks and some fantastic food specials the Wharf Hotel is a fantastic place to party over the Australia Day Long Weekend. Be sure to pop in on the Sunday for the Triple J Hottest 100. 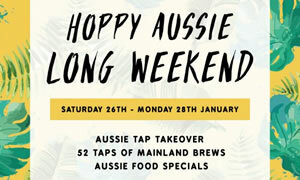 Hoppy Aussie Long Weekend Hopscotch is having an Aussie tap takeover this Australia Day weekend. So party with a weekend of DJ's and LIVE music including the Hottest 100 Countdown whilst you sample the 52 mainland brews on tap. Plus chow down on some great Aussie food specials. 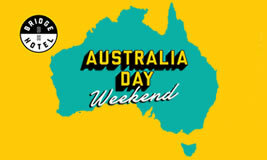 Australia Day LIVE Entertainment Treat yourself to a Australia Day Weekend of LIVE entertainment at an Iconic Melbourne venue. Party it up for Australia Day in the heart of Melbourne. 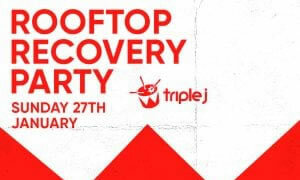 Post Aus Day Rooftop Recovery Party On Sunday recover from a big Australia Day with a party on Campari's rooftop. You'll be treated to some superb food and drink specials including a delicious burger and schooner deal as you party it up to the Triple J Hottest 100. Aus Day Long Weekend Party over the Aus Day Long weekend at Fargo & Co. Enjoy the Tennis coverage LIVE from thew terrace rooftop with cool drinks. On Australia Day treat yourself to a bottomless brunch and on Sunday DJ beats from 7pm. Plus don’t forget the Happy Hour drink specials over the weekend. 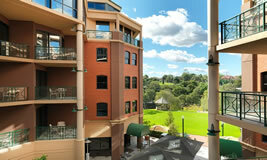 Australia Day Dining Head into Left Bank for Lunch or Dinner this Australia Day. You'll be treated a special menu featuring a selection of Coopers beers perfectly paired with a meal. Plus Aussie it up with Lamington or Pavlova cocktails. 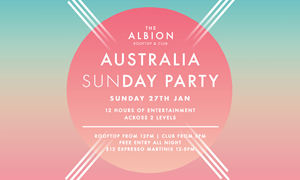 Australia Sunday Party Enjoy a 12 hour double Sunday Session. Party to 12 hours of entertainment over 2 levels. Dance into the night on the rooftop and in the club to a massive line up of acts. If wanting more then check for Aussie Day fireworks around the country and even head to the beaches like St Kilda with family and friends or look to a relaxing drive to the Mornington Peninsula or Yarra ranges! And in Melbourne family BBQ's and picnics are also very popular. The Big Days of fun keep on rolling and with Summer in full swing Melbourne will be abuzz in February for Valentine's Day. If you want to get a little cupid this 14th of February then make sure you checkout all the great Valentines ideas for Melbourne.